I distinctly recall the moment that Shadow of the Demon Lord hooked me. My players had penetrated a thick magical mist, venturing out to the island lair of an evil hag. After defeating her minions, they reached her inner sanctum, intent on defeating her and taking a powerful artifact for themselves. They faced off with the evil faerie in a tense battle, and for the first few turns, things seemed to be going their way. But she had a trick up her sleeve, one I’d been waiting to use for weeks: a spell they’d never heard of. She pointed her fingers at two of the heroes, whispered a baleful word, and magically fused their bodies together. The players were flabbergasted. They became a horrible mutant amalgamation of their two formerly individual characters. Their statistics changed. The merging wasn’t pretty; their new dual-minded, single-bodied character had an extra arm and some of an extra face. They adjusted, of course. The two victims shuffled their chairs around the table so that they could sit next to one another and strategize. Before I knew it, they’d regained their mojo, finished off the hag, and escaped her vile island. Once they reached safety, they asked whether the change was permanent. I shrugged and gave them a sly smile. “It is unless you find a way to fix it.” That moment still sticks with me, and it’s a perfect anecdote for this dark, unique role-playing game. As a longtime tabletop RPG player, I have played a lot of gaming systems, many of them needlessly complex. 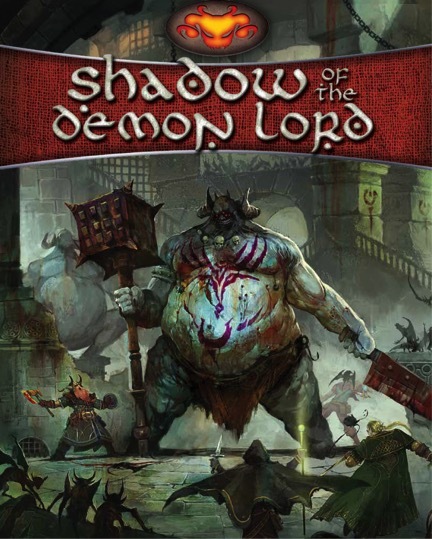 Schwalb Entertainment’s Shadow of the Demon Lord is different. It’s built on a foundation that anyone who has ever picked up a d20 will find familiar, but it distills complex rules into a simple, fast-paced system that simultaneously manages to keep players engaged with mechanical and narrative opportunities. It gives its game master (GM) a toolkit of zany tricks to use against players—tricks that heighten the drama and increase the fun without ever feeling unfair. But most importantly, it’s a dang good time for everyone involved. Shadow of the Demon Lord starts on familiar ground. Players begin by picking an ancestry, choosing from the usual options like human, dwarf, and orc plus a handful of unique choices, my favorite of which is the clockwork. Next, they choose a path. Path choices are broken into the three tiers of Novice (level 1), Expert (level 3), and Master (level 7). There are only four novice paths, covering the basic four character archetypes found in most high-fantasy RPG settings: Rogue, Warrior, Magician, and Priest. Expert and Master come in a much greater variety. As the characters gain levels, they gain abilities, statistics, and other utilities from their chosen ancestry or paths, making progression painlessly straightforward. Better yet, players aren’t railroaded into choosing a specific expert or master path based on their prior choices, meaning a priest could continue along the divine road to become a paladin or cleric or switch gears completely to become a fighter or spellbinder. This freedom to mix and match class archetypes is one of Shadow of the Demon Lord’s key differentiators; the frankly dizzying number of expert and master paths available gives players an impressive array of choices that can match any player’s wacky design ideas or adapt to a character’s in-game choices. The game itself is played with only a handful of dice: at the minimum, both players and the GM will need only a single d20 and a handful of d6s. When a player wants to do something, they roll the d20, adding any relevant modifiers from their character sheet to whatever they are trying to accomplish. The goal is to beat the target number. For most activities, this number is 10, the only exception being the defense score of a target being attacked, which can vary. But like any tabletop system worth its salt, Shadow of the Demon Lord both expects and accommodates the crazy things that can happen in any game. Situational roll modifiers are expressed by another of the game’s great features: banes and boons. A player who gains a bane or a boon includes negative or positive d6 rolls alongside their d20. These effects cancel each other out one to one, meaning a character with two positive boons and one negative bane would roll their base d20 and one d6, adding the two together for the final roll. Banes and boons also don’t stack; a player rolling three banes takes the highest number from their three d6 rolls and subtracts it from their d20 roll to find their total. Banes and boons make gameplay fluid and easy. Players know their target number is 10, and they know the game actively encourages them to find ways to add boons to their rolls. Likewise, it encourages the GM to find fun ways to stick players with banes, which act as a fair but beatable penalty. Combat is lightning fast. Gone are rolls to determine turn order. In this system, players always go first. Characters in combat can take either a fast turn (in which they can take one action or move) or a slow turn (in which they can take one action and also move). Combat is thus broken into four phases: player fast turns, enemy fast turns, player slow turns, enemy slow turns. Players acting on the same phase can act in any order. In my experience, combat in Shadow of the Demon Lord keeps every player’s eyes firmly on the table. It moves so quickly that it’s actually difficult to not pay attention—and, more importantly, this quick-phase system actively encourages players’ attention. The world of Shadow of the Demon Lord is one of moral ambiguity, dark deeds, and certain doom. The eponymous Demon Lord is not an enemy meant to be defeated; rather, it is the ultimate evil slowly devouring the universe in which the players must survive. As the world gets closer and closer to destruction and the Demon Lord’s influence grows, any number of sinister things can occur, such as wild magic or sudden, extreme weather conditions. There is no alignment system. Instead, deeds of sufficient evil cause players to gain corruption, which is a (sometimes literal) stain on their body and soul, the effect of the Demon Lord’s influence. Too much corruption will lead to a point of no return, and a player can lose their character forever to the Demon Lord’s embrace. It’s worth pointing out that this setting is dark and a bit twisted, and it’s not really meant for young eyes and ears. It is bloody, chaotic, and messy, and it deals with themes like insanity and death. Players may find their characters maimed, mutated, or killed before the end of their adventures. Demons take twisted, grotesque forms that are not for the faint of heart. Anyone wishing to avoid these nightmarish ideas may want to steer clear of Shadow of the Demon Lord’s darker setting. But that also addresses what I feel is its greatest strength: almost none of its rules are tied directly to this setting. Many rules are modular and can be optionally included or excluded at the GM’s discretion. While I personally find the setting interesting and ripe with opportunities for dark humor, I can absolutely see a scenario in which these themes are better left in the rule book. Shadow of the Demon Lord lets its GMs do just that. Any aspect of the game’s system could be pulled out of its world and applied to any other setting with relative ease. Filled with innovative mechanics and engaging ideas, Shadow of the Demon Lord is an impressive achievement. It begs to bend and flex with your group’s play style. It features a rich world full of narrative hooks that are available for you if you choose to use them. 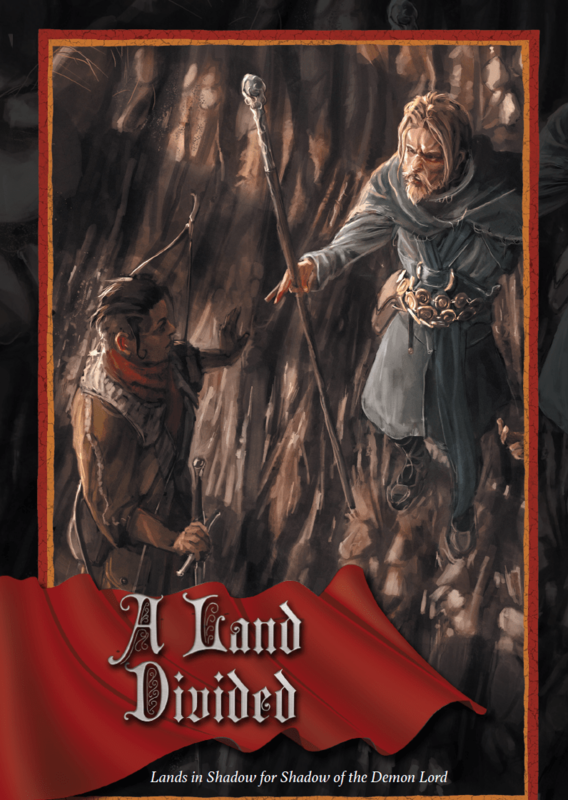 Its creator has published a staggering amount of supplemental material for it, including additional ancestry and path options, one-shot adventures, and even an alternative setting called Godless. But most importantly, it’s a heck of a lot of fun. Shadow of the Demon Lord is available in print and digital formats online from Schwalb Entertainment. Christopher is a published author and proud gaming nerd. He’s deeply passionate about tabletop RPGs, professional wrestling, and his Nintendo Switch. Thank you for the excellent, thorough review! Thanks for the review. although the thing that hooked you had nothing to do with SotDL, I have seen that effect happen in other systems, I have been in a D&D game where two players were playing as a single Ettin. When you pitch a game try to use the thing that sold you on it as something distinct about that system. What you said is like someone saying, I remember the first time I was hooked on _____, I went to a _____ rally and met several nice people. _____ members being nice has very little to do with whether or not the _____ movement is valid or meaningful.